Baugh's Blog: Film Review: Woody gets Ernest in "Midnight in Paris"
Film Review: Woody gets Ernest in "Midnight in Paris"
Owen Wilson channels Woody Allen in Allen's most recent film. I got interested in Ernest Hemingway in a big way back in 2010, after reading A Moveable Feast in Cuba. The book - published posthumously in 1964 - is Hemingway’s episodic memoir of his life in Paris in the early 1920s – focused especially on his relationships with fellow-American writers F. Scott Fitzgerald and Gertrude Stein. He acknowledges the debt he owes to both writers, as friends and critics, but in his final - very difficult - years, when he was writing this memoir (late '50s), his memories are tainted by a considerable amount of bitterness and envy. It’s a fascinating read. When I heard Woody Allen was making a romantic comedy/fantasy about time-travel back to Paris in the 1920s - Hemingway, Fitzgerald, Gertrude Stein, I knew it was a film for me. Woody Allen’s interest in Ernest Hemingway and the literary scene of 1920s Paris goes much further back than mine! There was a comedy sketch called “The Lost Generation” he used to do back in the mid-60s, when he worked as a stand-up comedian. You can find it on his album Standup Comic. The phrase “lost generation” comes from Gertrude Stein; she applied it to the young artists and writers living in Paris in that manic decade - "the roaring twenties" - which followed World War I. 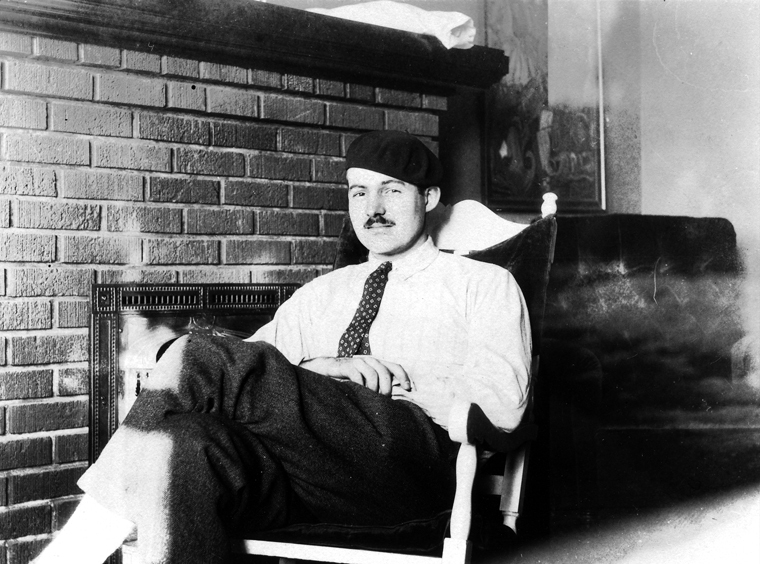 “You are all a lost generation,” Hemingway remembered her saying, and he used it as an epigram at the beginning of his first novel The Sun Also Rises (1926), which is set in that milieu. “I was in Europe many years ago with Ernest Hemingway,” Allen says in the sketch. “Hemingway had just written his first novel, and Gertrude Stein and I read it, and we said that is was a good novel, but not a great one, and that it needed some work, but it could be a fine book. And we laughed over it. Hemingway punched me in the mouth.” Right, Hemingway the boxer. Ernest Hemingway arrived in Paris with his wife Hadley in late December, 1921. He first met Stein the following February at her amazing apartment on Rue de Fleurus. This small apartment was more like a miniature art gallery - the walls were covered floor-to-ceiling with paintings by the likes of Picasso, Cezanne, Matisse, Delacroix and Braque. Stein was not only an avid art-collector (along with her brother Leo), but also an avant-garde literary writer. She soon became a mentor and sponsor for the twenty-two year-old Hemingway (Stein was then in her late-forties). Hemingway was still working as a journalist for The Toronto Star during those Paris years (1921-1926) - he wrote, on average, two articles a week for the paper* - but he had set out to become a serious writer of fiction. He had a burning ambition and in those early days was willing to listen to, to read, and to learn from the many literary greats of that generation who had gravitated to Paris: Ezra Pound, James Joyce, John Dos Passos, Ford Madox Ford, F. Scott Fitzgerald, etc. He read like a fiend. He started writing short stories and poems, but eventually turned his attention to novel-writing in 1924 – that first novel, The Sun Also Rises, a barely-disguised account of the life of some of the friends and acquaintances he had been hanging out with in Paris and Spain, established his reputation. His most important critics and writing coaches in those early Paris years were Ezra Pound and Gertrude Stein. Stein, in particular, endorsed the straight-forward, declarative style he had learned from newspaper writing - but she urged him to give up journalism and to concentrate on fiction. She stressed the importance of rhythm in prose, and the power that comes from repeating words and phrases. She favoured simple, colloquial language and advised him to avoid too much description - to shun writing that is full of florid adjectives and unnecessary adverbs. And he got his famous iceberg notion from her - the idea that meaning and emotion can be conveyed in prose more by what is left out, than by what is included. Hemingway went to Paris to become a writer - and he succeeded. Our protagonist in Woody Allen's recent film, Midnight in Paris, is also an aspiring writer enamoured with the city. Gil Pender (played by Owen Wilson - he does an uncanny job channelling Woody Allen) has come to Paris with his fiancee, Inez (Rachel McAdams) - they are tagging along with Inez's parents. Her father is on a business trip. Gil is a successful Hollywood scriptwriter, but he has aspirations of becoming a serious novelist - he is 400 pages into a novel about a man who owns a nostalgia shop. Inez thinks it's a romantic delusion and wants him to get back to the writing that has brought him some real success. She's a shallow materialist. He dreams of moving to Paris and re-living the 1920s experiences of his heroes Hemingway and Fitzgerald; she wants to move to Malibu. Gil: "This is unbelievable! Look at this! There's no city like this in the world. There never was." Inez: "You act like you've never been here before." Gil: "I don't get here often enough, that's the problem. Can you picture how drop dead gorgeous this city is in the rain? Imagine this town in the '20s. Paris in the '20s, in the rain. The artists and writers." Inez: "Why does every city have to be in the rain? What's wonderful about getting wet?" One evening, she goes off dancing with friends; he decides to stroll through the city streets on his way back to their hotel. He's rather inebriated and, after staggering around for a while, finds himself lost. He sits down on some steps to ponder his situation, when a nearby clock tolls midnight. A 1920s vintage car pulls up. A reveller opens a car door and invites him in for a ride. Gil hesitates, but then joins them. They're crammed into the back of the car, guzzling champagne and on their way to midnight adventures. They stop at a party. Everyone's in period dress. A pianist is singing a Cole Porter song. A couple of suavely-dressed Americans make his acquaintance and, before you can say Great Gatsby, Gil comes to the astonishing realisation that he's gone back in time. He's talking with the Fitzgeralds - Scott and Zelda - and the pianist singing the Cole Porter song is actually Cole Porter himself. They're in a party at Jean Cocteau's place! "Yes, it was a good book, because it was an honest book. And that's what war does to men. And there's nothing fine and noble about dying in the mud, unless you die gracefully, and then it's not only noble, but brave." “I’m actually a huge Mark Twain fan,” he replies; “and think you can even make the case that all modern American literature comes from Huckleberry Finn”. When I saw the film in my local cinema there were several other viewers who laughed out loud with me whenever Stoll delivered one of these typical gems. Laughing in recognition, I hope - not derision. But I know what my friend means. I guess it depends what you want the film to do. I saw the Hemingway portrait as the presentation of a stock figure (although Stoll still manages to give it human warmth and depth) and a foil for Gil Pender; allows Allen to ruminate on the nature and art of writing. 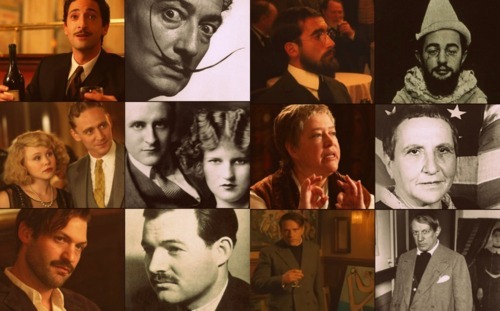 "I think what Woody Allen wanted was not for me to be Hemingway the person. He told me not to listen to recordings of him, or even read biographies. He really wanted me to be the Hemingway that you get when you read him. You know, he wanted me to be the writerly voice of Hemingway. And so I just stuck to his words". On the next night of Gil Pender’s midnight trips back to the 1920s, he brings the manuscript of his novel; Hemingway had promised to show it to his friend and critic Gertrude Stein. 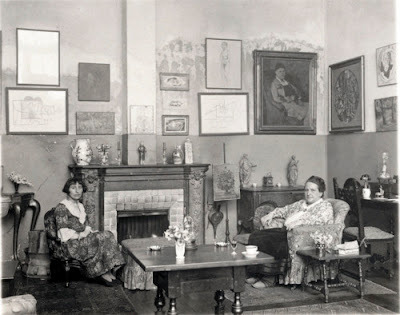 We meet Stein and her long-time partner Alice B. Toklas in their apartment on Rue de Fleurus. Also present is Pablo Picasso and Adriana, played by the lovely Marion Cotillard - whom you may have seen previously in her Oscar-winning performance as Edith Piaf in La Vie En Rose. Adriana is a “fictional” figure. She is not an historical figure being parodied or imitated. In the plot she plays the serial muse and lover for a string of famous artists – she has had affairs with Modigliani and Braque, among others, before meeting up with Picasso. Hemingway has his eyes on her, too. Well, she is alluring. But she falls for Gil, the sensitive, neurotic type - not Hem, the virile braggart. In future nighttime visits to 1920s Paris, Gil Pinder meets Louis Bunuel, Man Ray, T.S. Eliot, and Salvador Dali. Allen has fun riffing on things known to Gil and us informed film-goers. Gil makes a pitch to film-maker Bunuel, for example, about the subject for a film that wouldn’t be made until forty years later (The Exterminating Angel)! Eventually, though, the focus shifts from these meetings with famous figures from the visual and literary arts to the growing romance between Gil and Adriana. Concern for the cleverness of the fantasy fades as we follow Gil’s deepening attachment to her. And by the end of the film, we realise that it’s lessons about life and love that matter, not the chance to meet and hang out with one’s idols from the past. Gil goes back in time to discover how to live in the present. Graham Greene used to divide his books into two types: novels and entertainments. They were all novels, of course, but he considered some of them done more for fun and amusement (Our Man in Havana, for example), than as serious, literary works (The Heart of the Matter). Allen is like that, too. He has more serious work (Hannah and Her Sisters, Crimes and Misdemeanours); and then there are the entertainments. This is one of these clever entertainments. Does it succeed, then? Wonderfully so. First, it looks great. It’s shot in warm colours (yellows, oranges and reds), with the look of Kodachrome slides. The opening sequence is lovely; just like his film Manhattan (1979), which begins with a long portrait of New York City in three movements - day, night, and fireworks - accompanied by Gershwin’s Rhapsody in Blue, Midnight in Paris begins with a similar sequence of familiar vistas of central Paris in three movements - day, daytime-rain, and rain at night - accompanied by the wonderfully atmospheric “Si Tu Vois Ma Mere” by Sidney Bechet (one of the great early jazz musicians from New Orleans, who moved to Paris in the mid-1920s). The mood is set appropriately for sentiment and nostalgia. Allen, as always has written and directed the film. The script is brilliant – mixing romance, comedy, and fantasy time-travel. This is the sort of stuff Allen can write in his sleep. It’s just so light and amusing and clever. Is anyone as good as he with romantic comedy? – think Annie Hall. He knows how to dramatize comically the tensions and neuroses between couples. And here he sets up a clever contrast between Gil-in-the-present and Inez, and between Gil-in-the-past and Adriana. And, ultimately, it’s the romantic relationship between Gil and Adriana that matters most, not the authorial friendship between him and Hemingway. Allen is also good at fantasy. He knows how to play it for laughs. But he can also be very clever and innovative with it. Think of The Purple Rose of Cairo, where characters and situations interact with each other into, and out of, a movie screen. Midnight in Paris is more conventional than that as a fantasy, time-travel plot. The fun here is mostly with watching the parodies of known figures from the past, like Hemingway, Fitzgerald and Salvador Dali. But he does come up with a brilliant idea near the end that gives the fantasy a clever twist. The criticism that the pompous English character Paul (played by Michael Sheen), gives of Gil’s fruitless search for a “golden age” is played out in the relationship between Pinder and Adriana. Gil is so mesmerised by her that he doesn’t see it. But, then, Gil is sucked back even further in time to Paris in the Belle Epoque (dinner at Maxim's, meeting with Toulouse Lautrec, Edgar Degas, and Paul Gaugin) - Adriana’s own “golden age”. And here’s the kicker. Not only does she experience a trip back in time, but she decides to stay there – abandoning Gil to the 1920s, or is that the 2010s? It’s this event that finally prompts Gil to see the folly of his backwards-yearning, “golden-age” thinking. 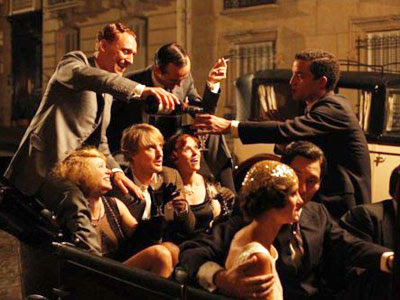 Midnight in Paris has been Woody Allen’s most successful film in many years. And it’s easy to see why: shot in Paris; focused on a fascinating period of twentieth-century arts and culture; with a clever plot; and witty dialogue; and good performances. This is Woody at the top of his game. If you like his breezy, intelligent, funny style, this is one film you should not miss. 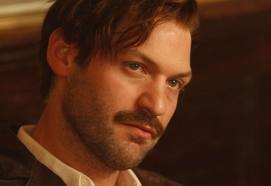 I still say Hemingway would have been better if we'd gotten to see a more personal side...Where was Hadley? And Allen flubbed it a bit when Hemingway took off to Africa with the gal--he was so broke in Paris he was eating pigeons--a less cliche Hemingway portrayal never would have felt the need to include a spontaneous (and impossibly expensive) African trip... You'll never change me, Baugh! A great review Clive. I learned a lot of stuff I didn't know before about Paris in the 20's. Of course I know about all the protagonists mentioned and have read some Hemingway and seen a lot of Picasso, Braque etc in the Tate Britain. You have given an intriguing incite into Woody Allen as well as the Paris of the 1920's. However, as I was reading your review I couldn't get a certain British sitcom out of my mind. I wonder if Woody Allen watched the British series, Goodnight Sweetheart, starring Nicholas Lyndhurst. Gary Sparrow, the erstwhile time traveller in the series, meets Noel Coward, Winston Churchill and the King and other people from the 1930's. I know, not quite Gertrude Stein, Picasso, Dali etc. But you can get my drift. ha! ha! You have definitely inspired me to see this film. It does sound GOOD!! !